In December 2016, MCC’s Board of Directors selected Burkina Faso as eligible to develop a compact program. This consultation is an opportunity for the development community to learn about the program’s potential projects, and discuss continued engagement. As a learning institution, MCC welcomes insights from the development community through these consultations. This event is closed to press. 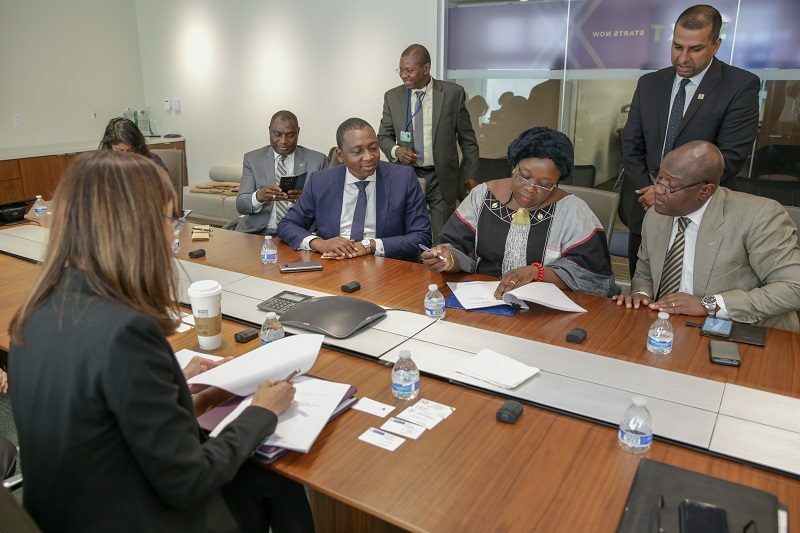 WASHINGTON, D.C., April 24, 2018 – The U.S. Government’s Millennium Challenge Corporation (MCC) last week announced $8.8 million in new funding to advance the development of a five-year MCC compact in Burkina Faso to reduce poverty through economic growth. MCC Principal Deputy Vice President Kyeh Kim was joined by Edith Clémence Yaka, Delegate Minister of Economy, Finances and Development charged with Budget; Dr. Bachir Ismaël Ouédraogo, Minister of Energy; Mr. Seydou Kabore, the Ambassador from Burkina Faso to the United States; Mr. Ambrose Kafando, Managing Director of Cooperation, Minister of Economy, Finances and Development; and Mr. Charles Luanga Ki-Zerbo, National Director for Burkina Faso of the West African Central Bank (BCEAO) for the signing of the agreement at MCC headquarters in Washington D.C.
MCC Principal Deputy Vice President Kyeh Kim and Edith Clémence Yaka, Burkina Faso’s Delegate Minister of Economy, Finances and Development charged with Budget sign the funding agreement to support compact development. As part of the compact development process, MCC and the Government of Burkina Faso have conducted a constraints-to-growth analysis to identify sectors and investments that present the greatest opportunity for inclusive economic growth. Based on this analysis and the Government of Burkina Faso’s economic priorities, MCC and Burkina Faso are pursuing an energy-focused program that includes infrastructure, institutional strengthening and skills development activities. MCC’s Burkina Faso Country Team is working with the Unite de Coordination de la Formulation du 2e Compact du Burkina Faso (UCF-Burkina), an entity established by the Government of Burkina Faso, to develop a detailed proposal for compact investment to present to the MCC Board of Directors for approval. The MCC country team and UCF-Burkina are consulting with a wide range of stakeholders to collect input – including potential beneficiaries, the private sector, civil society, other donors, and relevant government entities. Burkina Faso was initially selected by MCC’s Board of Directors as eligible for a second compact in December 2016. 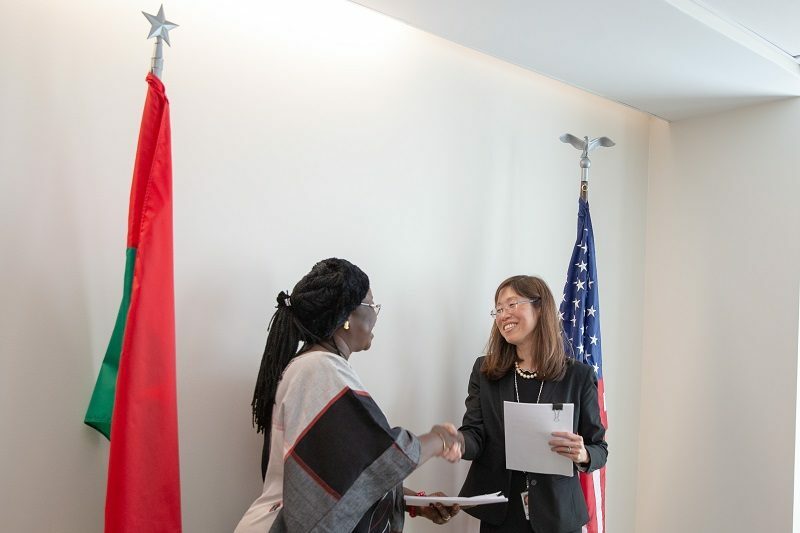 MCC Principal Deputy Vice President Kyeh Kim shakes hands with Edith Clémence Yaka, Burkina Faso’s Delegate Minister of Economy, Finances and Development charged with Budget following the signing ceremony. Using an approach that reflects a country’s own priorities, MCC provides time-limited grants and assistance to developing countries that meet rigorous standards for good governance, from fighting corruption to respecting democratic rights. Working with local partners, MCC tackles some of the most pressing challenges that developing countries face. Note: This release was originally published by the U.S. Embassy in Burkina Faso.